We are an online community for meteorology enthusiasts. 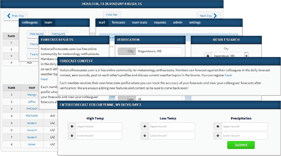 Members can forecast against their colleagues in the daily forecast contest, earn awards, post on each other’s profiles and discuss current weather topics in the forums. You can sign up here! 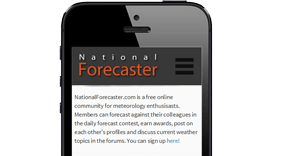 Each member receives their own forecaster profile where you can track the accuracy of your forecasts and view your colleagues’ forecasts after verification. We are always adding new features and content so be sure to come back soon! Profiles – Every member gets their very own profile. Keep track of your stats and chat with friends! Go Mobile – Keep track of your stats on the go! The site works on all devices. 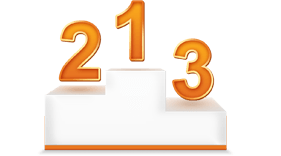 Get Ranked – Forecast for fun or get ranked among some of the top forecasters in the country. Each member receives their own profile where you can track your forecasting stats and progress, chat with friends and show off your awards. Collegiate members can also keep track of their team stats right from their profile and join team-wide discussions. All members can participate in the daily forecast contest. The contest is typically comprised of 5 to 7 cities with 2 week forecasting periods for each city. Non-collegiate members are ranked among all collegiate members but are not eligible for any collegiate level grand prizes. Awards are given to the top 3 forecasters of each category for each city. The award badges are automatically displayed on your profile after winning. Team awards are given at the end of each season while other awards are given to forecasters with exceptional performance and overall city winners.